Jules Verne was a famous French novelist, playwright, and poet. He is well known for his successful adventure novels as well as his significant influence on the science fiction literary genre. This French writer is considered by many to be the father of modern science fiction writing. His most famous novels are Journey to the Center of the Earth and Twenty Thousand Leagues Under the Sea. His works demonstrate his brilliant understanding of the many technical achievements that mankind can produce. Verne was born in Nantes, France, in February of 1828. His was the eldest son of Pierre Verne, a prosperous lawyer. He was brought up in a middle class family. He was rebellious as a child and learned to quickly escape into his unique imaginary world. These rebellious feelings showed up later in several of his novels. He was mostly educated at Catholic schools. When he was twelve years old, he ran away to work on a ship as a cabin boy. His father stopped him before the ship went to sea. At that time, Jules had to promise his parents that he would just travel in his own imagination instead of on a ship. In 1847, he went to Paris to study law, even though he was planning a literary career. He made friends with Alexandre Dumas, a famous French author who helped get his first play, Broken Straws, produced in 1850. After that, he had worked as secretary for a theater while he continued to write operettas, comedies, and short stories. During a visit to another city in France, Amiens, Verne fell deeply in love with Honorine Morel. He married her in January of 1857. After his marriage, he became a stockbroker in Paris. In July of 1858, Verne travelled to England and Scotland and this was the first time he left France. His first novel, Five Weeks in a Balloon, was published in January of 1863. It was about travels over central Africa, which in those days this region was virtually unexplored. The book was an instantaneous success and he quit his job to spend all of his time writing. In 1864, Verne wrote another successful novel, A Journey to the Center of the Earth, which is about a group of scientists and explorers that descend into an Icelandic volcano’s crater and discover an amazing underground world. His book From the Earth to the Moon was published in 1865, as well as its sequel in 1870, Round the Moon. In these books, he wrote about weightlessness that his astronaut characters had experienced. He had their launching area located in Florida, which was well before America’s National Aeronautics and Space Administration or NASA. He wrote his two most famous masterpieces during his 40s. His 1870 novel, Twenty Thousand Leagues Under the Sea, is about the voyage of the Nautilus submarine and Captain Nemo. Verne’s 1873 novel, Around the World in Eighty Days, is about a successful bet that was made by Phineas Fogg, a character that was obsessed with punctuality. In 1886, Verne was shot in the leg by his mentally ill nephew and it left him disabled. This incident left him with a permanent limp. In his retirement years, he suffered with diabetes and he became partially blind in 1902. He died at his Amiens home in March of 1905. 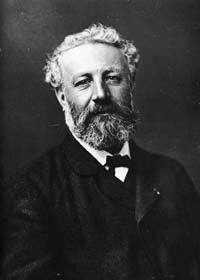 Jules Verne wrote close to 80 books during his lifetime. His books continue to sell well today and many people still watch the 1950s and 1960s movies that were based on them.